Euro Truck Simulator 2 from Czech developer SCS Software follows a series of previously-released truck and driving simulation games with a reworked and highly-improved engine that foremost focuses on realism, yet while also incorporating entertaining and rewarding gameplay. As most simulation games often suffer from lackluster gameplay, I was most surprised with with the game's wide variety of content in addition to the stellar gameplay and presentation. 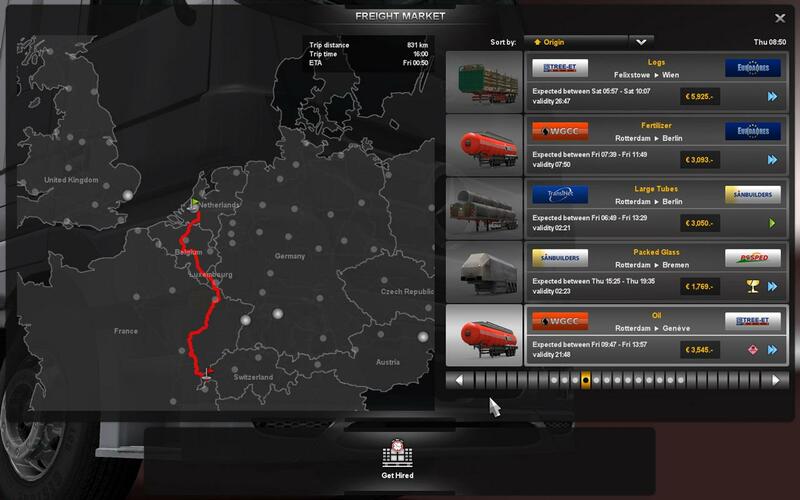 In Euro Truck Simulation 2, players are tasked with transporting cargo to more than 60 different European cities in countries ranging from the United Kingdom and Belgium to Germany and the Netherlands. The ultimate objective is for players to manage the operation of their own cargo business and additional tasks such as hiring employees and purchasing more garages and trucks. As players begin their business, they must first take quick jobs before entering the freight market as they don't own an actual truck. In quick jobs, players are provided a specific type of truck and cargo and requested to arrive at the destination in a given amount of time. 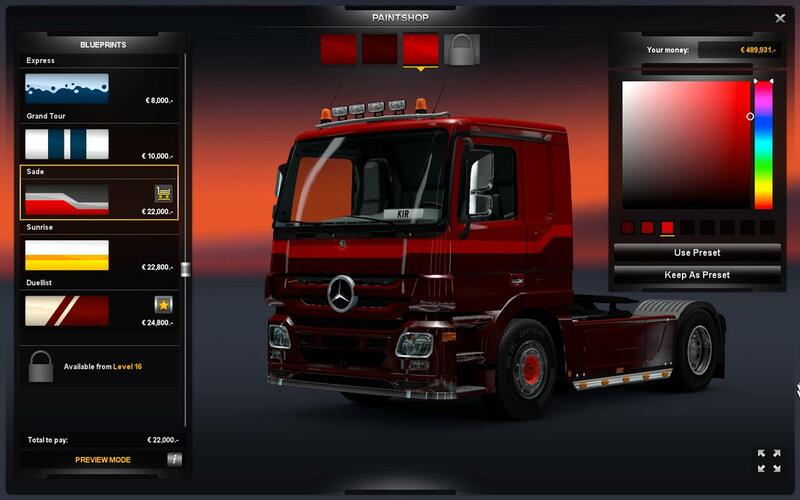 Once enough money has been earned, players can then purchase a truck of their own to customize. With no experience of trucking or the transportation of cargo, I was a little worried that I would surely end up as a failed trucker. However, I was surprised with the game's simple introduction in how it teaches players the basics of transporting cargo from one destination to another. Even the game's control setup is highly-intuitive in how it explains the various methods such as mouse and keyboard in regards to difficulty for beginner players. I opted for the keyboard control method as I found the mouse a bit too sensitive for turns and such. The game even has built-in support for players that own an entire steering wheel and pedal setup. As players complete quick jobs and freight requests, they earn experience points that can be spent on various skills from better gas management to the unlocking of additional hazardous and fragile cargo for hauling. Cargo can range from a variety of objects and containers from construction equipment to frozen peas. Each cargo will also have its own handling mechanics that depend on both the length and weight. Players are continually tasked with earning money to run their business operations, in addition to gaining experience points to advance in career status. I enjoyed the added incentive to drive just one more trip to either unlock new items for my truck or gain status to haul more lucrative cargo. Before switching from the quick jobs to purchasing my first truck, I ensured that I saved enough money for a vehicle that would include all the fancy parts from chrome rims to a powerful engine. 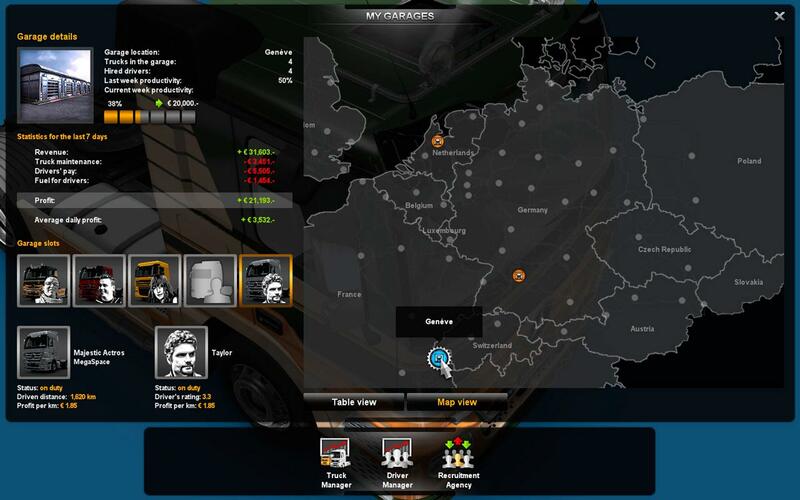 Spread across the game world are dealerships in which players can enter and view trucks that are available for purchase. Trucks, parts, and cosmetic items at dealerships are unlocked as players advance in career status levels. The amount of customization options for trucks is staggering from parts like the engine and exhaust pipes to additional cosmetic tweaks such as paint jobs and placement of lights. The game also features trucks from licensed brands including MAN, Renault, and Scania to name a few. From selecting my freight missions and hiring additional drivers to customizing trucks and exploring the massive road network, Euro Truck Simulator 2 successfully combines various role-playing elements with the simulation genre. The game's world is absolutely massive in scope. From scenic countrysides to tunnels curving through mountain hills, driving your truck to and from each destination is always an opportunity to see more of the many included countries. Iconic cities and landmarks populate the world in addition to gas stations, rest stops, and toll booths. While some of the cities either feel rather small or closed off to prevent further exploration such as London, the game's world is often vibrant with life from cars, buses, and trucks going about their business. I only wish that cities would have been populated with more people walking around as they often feel rather drab. I was also impressed by the game's attention to details such as the side of the road in which vehicles drive based on the particular country and even other trucks that stop at gas stations for a fuel refill. The diversity of each country's landscape ensures that each trip is paired with an addictive incentive to explore every city and road in the game's world. Fortunately, the game keeps track of the roads traveled by changing their color on the in-game map, in addition to an overall percentage counter of the world that has been explored. Once players purchase their first truck, they have ultimate freedom in exploring the entirety of the game's world with the only limitations of paying for fuel refills and toll booth fees. As I don't have the money or desire to begin my own trucking business, I'll have to suffice for now with the spectacular experience that's presented in Euro Truck Simulator 2. Most simulation games gain a reputation of realistic gameplay mechanics combined with poor presentation of both visuals and sound. Not only was I surprised by the varied amount of content and realistic gameplay mechanics, the game surprised me yet again with beautifully-rendered landscapes and cities. The game's world also supports a day and night cycle that is complete with various weather effects from rain to fog. The most noteworthy aspect of the game's presentation is the highly-detailed truck exterior and interiors. The truck's dashboard interiors with dynamic speedometers and digital screens, which are even unique to each vehicle model, are some of the best I've seen in any simulation game. The sound of trucks in both exterior and interior views contain that distinct rumble as they throttles through gears. Sound effects from horns to turning signals are all top-notch and as with the game's visuals. In relation to both the overall presentation and especially the game's sound is the addition of an in-game radio feature that supports the streaming of actual stations from European countries. I was completely sold on the virtual trucking experience as I was hauling my cargo of frozen peas from London to Brighton, at the same while blaring a radio station mixed with American chart toppers and French hosts laughing over a completely unknown topic to me. As someone that has always been interested in the simulation genre, I was continually surprised by the new standards set by Euro Truck Simulator 2. The developers at SCS Software have proved that the often lackluster simulation genre can be brought back to life with games that deliver both realistic and entertaining gameplay. 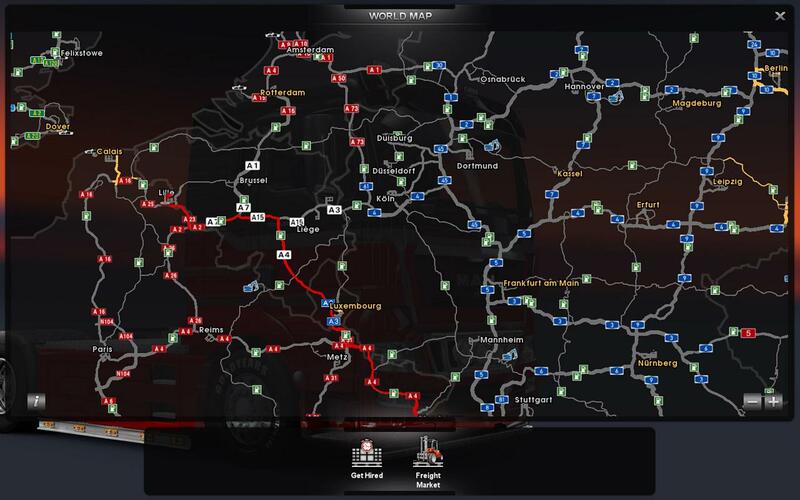 Elements of the game's design ranging from the varied content to the customization ensure that beginner players and simulation enthusiasts will discover their desired virtual trucking experience. While a few spots of inconsistency exist with game's cities, the majority of content is presented with the utmost polish and detail that few games are able to achieve. 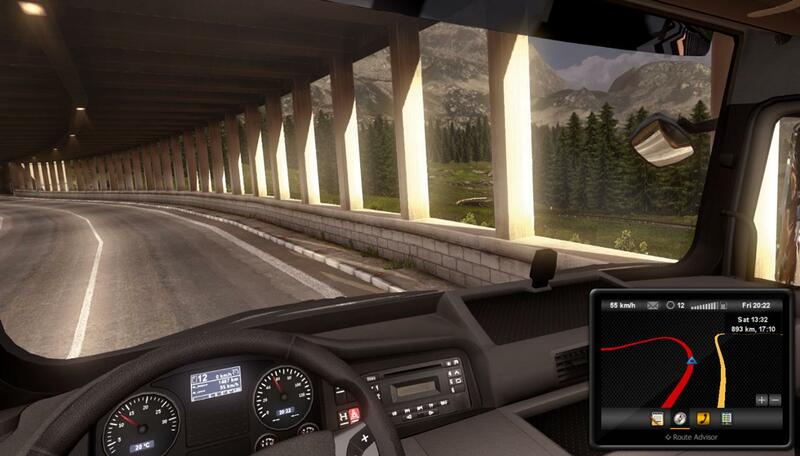 Put simply, Euro Truck Simulator 2 sets a new standard for the simulation genre. 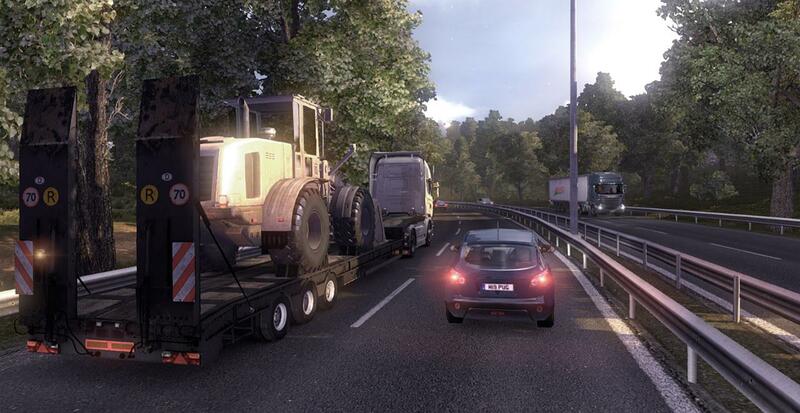 Euro Truck Simulator 2 is available now for Windows PC. Visit the Euro Truck Simulator 2 website for further information and a free trial version. Euro Truck Simulator 2 from SCS Software combines a realistic trucking experience with rewarding and most importantly, entertaining gameplay. Both beginner players and simulation enthusiasts will appreciate the massive game world to explore, never-ending supply of cargo trips to complete, business tasks to manage, trucks to customize, and career experience to earn. With its stellar gameplay and presentation, Euro Truck Simulator 2 sets a new standard for the simulation genre. I've been writing for Gaming Nexus since 2011 and focus primarily on PC games and hardware. I'm a strong advocate of independent developers and am always seeking the next genre-breaking and unique game releases. My favorite game genres are strategy, role-playing, and simulation, or any games that feature open worlds and survival elements.